Antique double row pearl bangle. 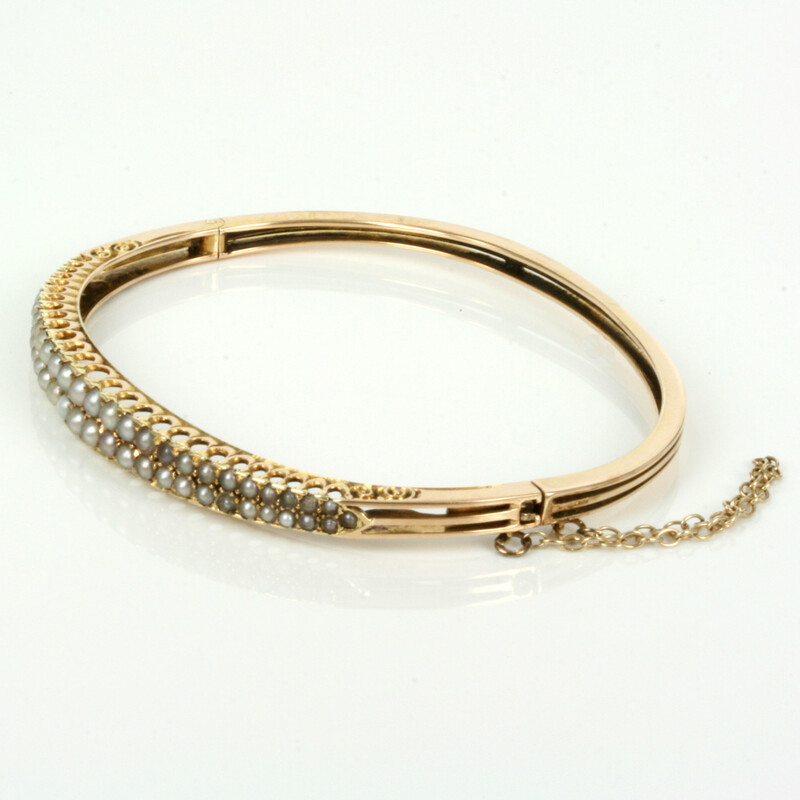 Product code: ES3349 Categories: Sold Items, Sold Jewellery. There are pearl bangles, then there are pearl bangles and here is a magnificent antique pearl bangle that would have taken so long to obtain the pearls so that they graduate so perfectly in size. Made in the early 1900’s in 15ct rose gold, this antique hinged bangle is set with two rows of pearls with one more pearl set at each end. On each row there are 27 pearls and sitting in two rows makes it look so charming when it is on the wrist. However it was not simply a case for the jewellery who made this to set a series of pearls in line, it is the magnificent graduation in size that they go from. The pearls graduate so magnificently and go from smaller at each end to larger in the centre and looks all the more amazing when this is done not once, but twice perfectly for each row. From the side you can see the wonderful bridge work typical of antique jewellery from this era and being an oval hinged bangle allows this to sits nice and close to the wrist making it a practical bangle to wear all the time day or night. The pearls graduate so perfectly you will have a hard time finding where and when the sizes increase and will have you admiring it every time that it is on your wrist.